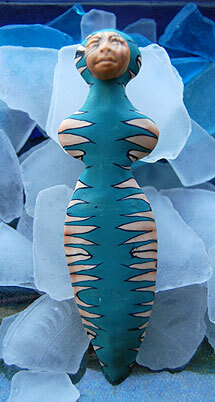 Last Saturday at my polymer clay guild meeting, I created a little goddess for my Mom’s birthday. I used the spliced cane technique for her body and a mold for her face. She seems to be gazing heavenward doing some deep thinking, doesn’t she? I learned how to create this cane last month at Klay Karma 2007. Diane from the CT guild generously shared this technique in a demo. I absolutely love the look and have many ideas swirling around in my imagination. My S.O. said it looks like she has flames on her. I’m thinking about making the Hawaiian Volcano Goddess, Pele, as my next project with this cane. This entry was posted in Art Dolls, Polymer Clay. Oh, I think we are kindred spirits! I love Goddess things! Oh Wow I hope you will share you Pele interpretation with you. This is a beautiful technique. What a wonderful birthday gift for you mom!